Board your comfortable coach upon hotel pickup in Taipei city in the afternoon, and relax during the scenic drive along Taiwan’s northeast coast. This National Scenic Area, noted for its numerous capes and bays backed by green mountains, is a common swimming spot for the locals and a popular destination for visitors to Taipei. Your guide passes by Chinkuashin Village and visits the emerald-colored Bitou Cape, where you can view sea-eroded landforms on the cape's hanging cliffs. Continue your half-day tour to the Nanya coastline along a coral shore filled with whimsical rock formations formed by weathering sandstone. Your guide explains how the striped pattern in the rock is created by oxidized iron ore. Then enjoy more postcard views at the Yin-Yang Sea (Bay of Two Colors). 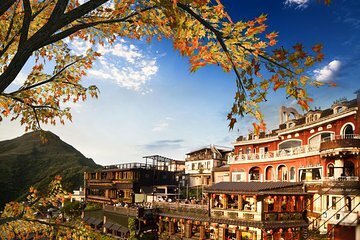 On arrival at the former gold mining village of Jiufen, be enchanted by a picturesque setting of old homes clinging to steep mountainsides. Meander past the cozy teahouses of Jiufen Old Street, a narrow, cobbled street that offers a glimpses into the past. You’ll appreciate the atmosphere that inspired the sets featured in the Oscar-winning animation Spirited Away. Your tour ends with return transport to your Taipei hotel in the evening. A great and easy way to kill 4 hours. The beaches and mining areas on this tour are spectacular. Jiufen Villiage is great but be warned it is PACKED with people, SO BUSY...Frank was a good guide, encouraging us to take photos and had ample knowledge for all the sites we saw and the history of Taiwan. Guide was very knowledgeable and was very helpful. He told us the history of Jioufen and how it manages to survive in modern times. Great tour. The driver was safe and Thomas the tour guide was very knowledgeable about the area. We had time to see the town which is good because there are many market stalls to peruse!! I would recommend this tour. Well organized and evenly paced, this tour took us through the bustling shopping area of Jiufen and we had a great experience. The tour guide was also very friendly. Highly recommended. It can be a good tour if you are not hurried at each step. 1 Van driver was very reckless and speeding and not stopping at traffic lights, especially during coastal drive along the north east shore of KeeLung. He would avoid stopping the van at traffic light with 7 tourists, and 1 tour guide by swirling around all the stopped cars to get ahead. He almost hit numerous cars ahead of us before a bridge heading out of Taipei city, all our belongings flew to the floor of the van. 2 tour guide was good, but we stopped too long by the coast for really no reason. 4 I would recommend hiring a private driver, and spend the time to tour the very mountainous area, rather than sweating riding in the van w/the reckless driver. Village very interesting. Would have like to have had time to see the temple. It could have been better if it was not raining. We had showers most of the time along the coastline and pouring at Jiufen village. A good half day getaway to see the Jiufen Village market, and the Coastline.... great food and shopping market at Jiufen!